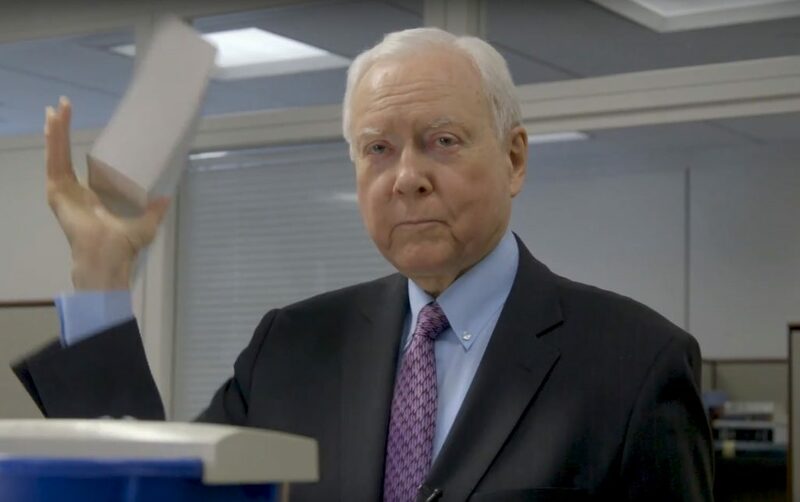 ST. GEORGE – With Tax Day 2018 being the last day Americans will file under a system largely unchanged since the 1980s, Sen. Orrin Hatch, R-Utah, decided to commemorate the occasion by taking a copy of the old tax code and shredding it – an event he chronicled on video and shared with the internet. View the video in the media player above. The old tax code, which Hatch has called “broken” and “outdated,” was replaced last fall with a massive tax overhaul passed by Congress and signed into law by President Donald Trump. “I am forever grateful to the great citizens of Utah who have trusted me with ushering in our next generation tax code,” Hatch said in an op-ed published in the Daily Herald Tuesday. “These changes are a welcome ‘spring cleaning’ of our outdated and uncompetitive system. Perhaps now, more than ever, we can proclaim: Out with the old, and in with the new!” he said. Hatch, who is also the chairman of the Senate Finance Committee, has touted the sweeping tax reform, officially titled “Tax Cuts and Jobs Acts,” as a great benefit to the national economy and relief to the American taxpayer. More jobs, higher wages and increased economic growth. Greater opportunities for American businesses to invest at home. Hatch touts tax overhaul as big benefit to the middle class. Others say it will raise taxes for 14 million Americans. Orrin is such a worthless tool. The “new” tax code is still a bloated mess that favors corporations and the wealthy. Despite Republicans’ promises, we will not be able to do our tax returns on a postcard. Just like mesaman, Orrin is a lifetime government worker who made a career out of ripping off the taxpayers. That’s because you know it all, right? Stop wiping with cactus and please include some factual evidence. Here are a few facts!! 1) Tax reform will increase deficits by $1.46 trillion over the next decade. That’s the net number that’s been crunched by the nonpartisan Joint Committee on Taxation. 2) Before tax reform passed, people could deduct the cost of having their taxes prepared by a professional, or the money they spent on tax prep software. That break has been eliminated. 3) Losses sustained due to a fire, storm, shipwreck or theft that aren’t covered by insurance used to be deductible, assuming they exceeded 10% of adjusted gross income. But now through 2025, people can only claim that deduction if they’ve been affected by an official national disaster. That would make someone whose house was destroyed by a California wildfire potentially eligible for some relief, while disqualifying the victim of a random house fire. 4) The tax cut for individuals will slowly decrease over time — and end altogether in 2025. But not for corporations, they keep their cuts until we change the Tax Code again which could be decades. You can also add on to that the loss of the alimony deduction which will cost me over $25,000 in deductions. Also interest on mortgage is no longer deductible. Taking care of the little guy, you bet. What a bunch of jerks. My BS filter works Stella! I think you have a condom stuck in your sinus! To silence those of us who think you are a light-weight thinker, why not list all your accomplishments, say up to 40 or so years, the equivalent of when Hatch became a senator? I would like to compare yours with his, that is if you are up to the challenge. Now, while we are waiting for your autobio, why don’t you explain the new “bloated mess” tax code, revealing all the fails the directly affect your taxes? The tax code looks all fine and dandy now, but wait until the tax breaks stop for everyone except corporations, then we will see everyone finally yell foul. Everyone knows this is only a good tax code for the wealthy. Enjoy your few extra bucks on your paycheck now, because in a few years you will lose your tax cut while the 1% keeps laughing about keeping theirs forever. Everyone knows?? BS NF, your interpretation is nothing more than a guile-less opinion punctuated by your liberal Hilary thinking. You did support the light-weight thinker comment, however. As it happens, that’s kind of how a lot of us feel about Hatch. Now if we could just get an encore with the new code that would be fine too. Right. Just another new suit for the Emperor. Did someone hold Hatchs hand and tell him where to press the start button? I got a $10 per month increase from the glorious repugnican tax sham, but it was immediately taken by increases in health care.